In Knitting Daily TV episode 410, travel on location to meet Cecily Glowik MacDonald and Melissa LaBarre, authors of New England Knits: Timeless Knitwear with a Modern Twist (Interweave, Summer 2010) to discuss the quitessential New England style and signature fibers of New England knitters. Download the free pattern for the Chelsea Skirt, featured on epside 410. This skirt is shown in Classic Elite Yarns; visit Classic Elite Yarns for more information. Cherish the gorgeous and timeless appeal of America’s northeast with this irresistible collection. 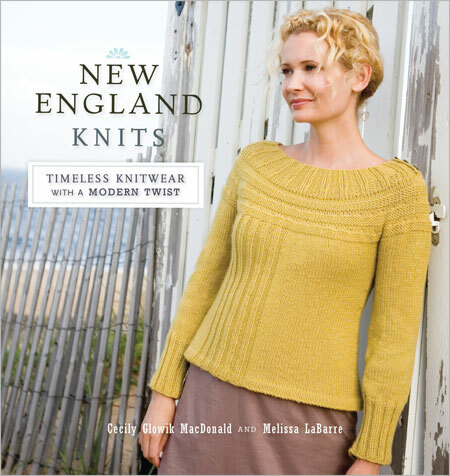 Inspired by autumn, winter, and spring in new England (where the savvy knitter is never far from a sweater between September and March), New England Knits delivers 25 gorgeous patterns with classic wearability and contemporary style. Inspired by their daily surroundings, New England-based designers Cecily Glowik MacDonald and Melissa LaBarre created each piece to distinctly showcase the weather, colors, and culture of the region they so love. Projects by four guest designers from new England yarn companies round out the collection. Lushly photographed, New England Knits is divided into three classic themes: Around the Town, Fall on the Farm, and Along the Coast. Within each section you’ll find beautiful multiseasonal clothes and accessories, such as cardigans for layering or scarves to warm your neck when the temperatures dip. You’ll also fall in love with soft sweaters, durable bags, cozy mittens, and more! With New England Knits, you’ll have everything you need for a perfect new England-inspired wardrobe. Knitting Daily TV is an exciting needle crafts how-to program on public television covering everything from knitting and crochet to stitching, felting, and spinning. The show guides viewers in learning to make fun yet smart one-of-a-kind designs using the latest products in yarn and fiber. Download free patterns, meet trendsetting knit and crochet designers, and improve or learn new skills and techniques. Get the entire Series 400 of Knitting Daily on a 4-Disc DVD Collection! Click here to purchase DVDs of this season or previous seasons of Knitting Daily TV. Knitting Daily TV is airing on PBS stations nationwide and new markets are being adding to the schedule all the time. Each individual public television station chooses when and if to air the program. If it is not airing in your local market, please call, write, or e-mail and let them know you are a viewer of the station and would like to see Knitting Daily TV. You can bring Knitting Daily TV to your local PBS station. Thank you!